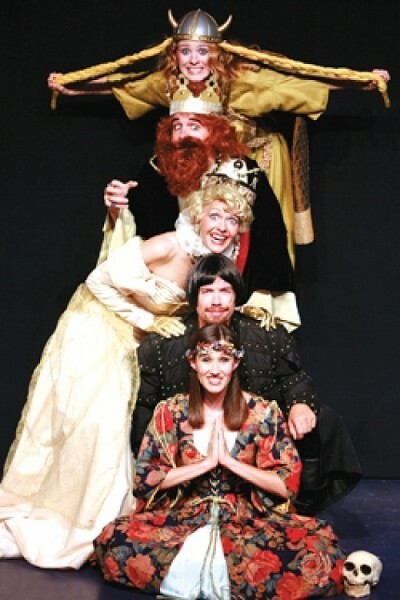 Theater: The spoof humor of Desert Star’s Spamlet must be somebody else’s scene. The lobby of the Desert Star Playhouse is made to look like the miniature Main Street of an idealized Old West town. Log-hewn storefronts lead to the theater. To the right is the racket of a commercial kitchen and the smell of pizza. I’m here to see the playhouse’s newest musical-comedy parody, Spamlet. You know, like Hamlet, but with Spam in the title because Spam is inherently, ironically funny (and maybe because Monty Python’s Spamalot is, coincidentally, coming to town). All this suggests to me that the dramatic arts are not necessarily held to the same standard here as they might be in theaters elsewhere. But maybe I’m just being cynical. Everybody else seems to be having a grand time. Families with small children, older couples, young couples—everybody’s enjoying a heck of a night on the town, quaffing raspberry lemonade and Diet Coke with abandon. Only my companion and I seem to be glancing around and consulting in hushed tones. This is not our scene. As the title suggests, the show follows the plot of William Shakespeare’s Hamlet, except that everybody doesn’t die at the end (spoiler warning). There is a young prince of Denmark despondent over the recent and abrupt death of his father. The prince’s name is Spamlet (Paul Thomas Murphy), for no reason I could discern other then the aforementioned inherent ironic funniness. He is the Hero, and the audience is expected to, literally, cheer for him. His mother, Gertrude (Mary Parker Williams), has married Contagious (Matt Kohler), the brother of the late king. Contagious has a big gold crown and a big red beard and looks a lot like the king from the recent Burger King ad campaign but without the welcoming smile. There are burger jokes later in the show to highlight the resemblance. He’s the guy we’re supposed to boo. The ghost of Spamlet’s father is portrayed simultaneously as Homer Simpson and Darth Vader, with appropriate John Williams scoring. One or the other could have been hilarious, but the combination is just muddled and indicates a lack of decision-making of any kind on the part of the author. Instead of Laerates, we get Laxative (Justin Berry), whose name seems to have been changed for the sole purpose of allowing poop and fart jokes. So many poop and fart jokes. I mean, think of how many poop and fart jokes would be too many and then add a few more. Humor in this vein is the real problem with the script of Spamlet (written by Ben E. Millet). I understand that unapologetically broad, obvious and lowbrow work is the claim to fame of Desert Star. I don’t fault them for that. I still enjoy a Naked Gun movie on occasion. My problem is not the concept but its execution. Pop-culture references are thrown against the wall and expected to stick, not because they lend insight or texture, but because they are familiar. The mere mention of the title of a popular TV series or starlet is expected to get laughs—and, unfortunately, it works. It’s not in poor taste necessarily; it’s just lazy. It lacks creativity. It isn’t clever, it’s simply easy. I don’t even want to go into the “To bee or not to bee?” soliloquy. Suffice it to say, there’s a bee costume involved. All in all, the performers do a fine job with the material they’re given. The Hero is heroic, the Villain is villainous and the supporting characters appropriately bumbling and dim-witted. There were even several occasions in which an actor would momentarily break character and acknowledge the low quality of the jokes but only to get more laughs for the wrong reasons. Like I said, maybe I’m just cynical—and maybe the Desert Star just isn’t my scene. My pizza was pretty good, though.